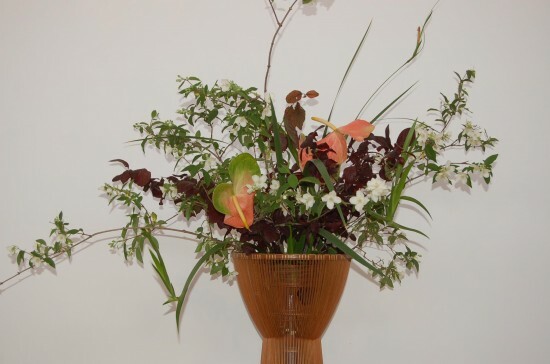 Ikenobo Shimbashi Wafu-Kai will present the 50th Anniversary Flower Arrangement Exhibition this weekend at the Japanese American Cultural and Community Center, 244 S. San Pedro St. in Little Tokyo. The event will celebrate Kazuko “Shunho” Shimbashi’s 50th anniversary as head teacher of the Los Angeles Chapter of the Ikenobo School. Her members’ flower arrangements will be displayed. On Saturday, June 1, the ribbon-cutting will be held at 9:30 a.m., followed by an opening ceremony with music by Kokoro Daiko. The exhibition will be on view at the JACCC’s George J. Doizaki Gallery from 10 a.m. to 5 p.m. Admission is free. An anniversary banquet will start at 6 p.m. at the DoubleTree by Hilton, 120 S. Los Angeles St. Professor Mayumi Chino will give an ikebana demonstration. The exhibition will continue on Sunday, June 2, from 10 a.m. to 4 p.m.
For more information, call the JACCC at (213) 628-2725 or Kazuko Shimbashi at (323) 295-7424.